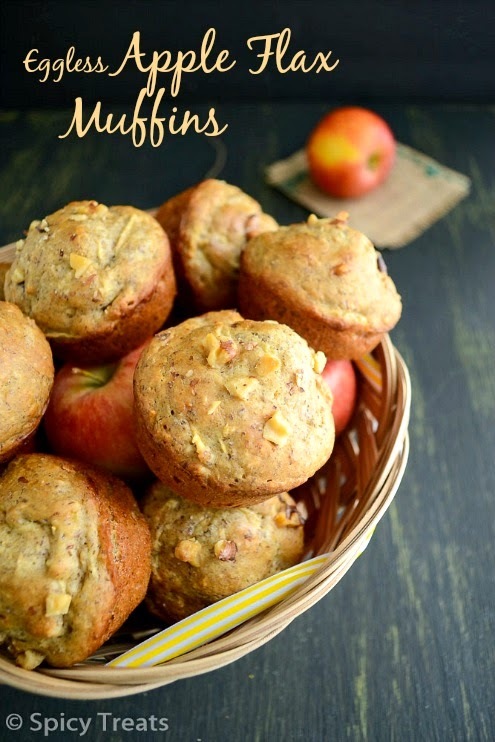 For This week's Love2Bake event, I am sharing a low calorie, low fat, fiber rich, egg free and butter free Flax Apple Muffins. I got this recipe from the Milled Flax seeds' box. 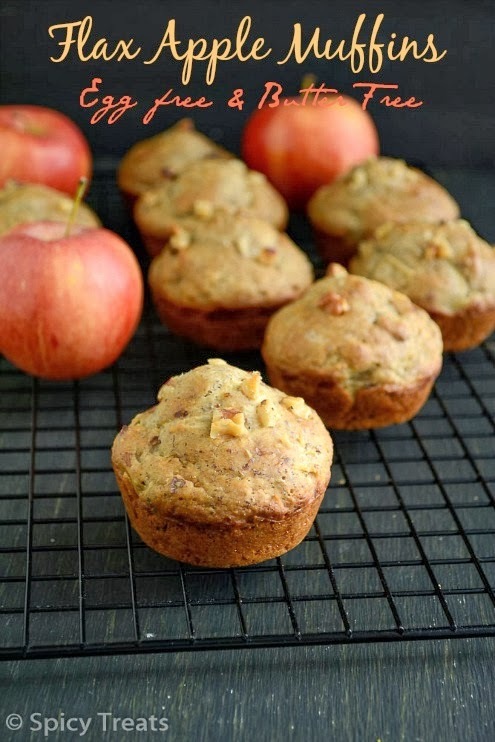 The actual Flax Apple Muffins recipe is with egg but I tried it as Eggless muffins by adding banana puree. To my surprise the muffins turned out so good, soft and aromatic. These muffins are perfect for breakfast with some milk and fruits or a perfect after school snack for kids. 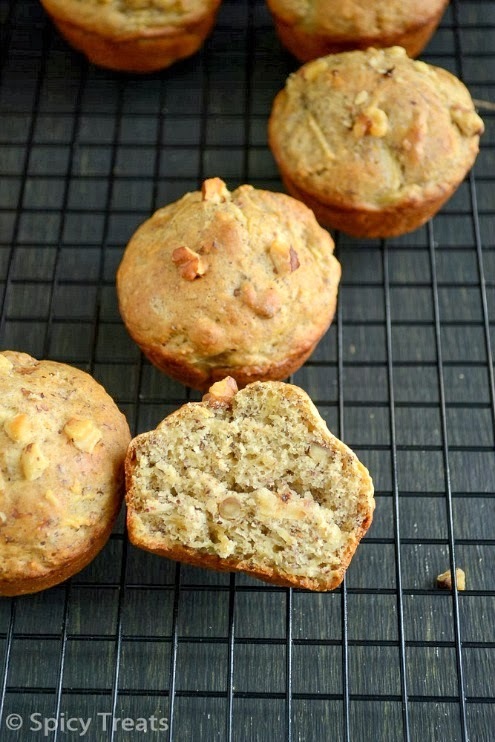 My kids loved these muffins a lot and the muffins vanished in one day itself. In a mixing bowl, combine all the dry ingredients-flours, milled flax seeds, sugar, baking soda, baking powder, salt and keep aside. In another, add banana puree, oil, milk and stir well. Now add this liquid ingredients to the dry ingredients and stir until just blended. Fold in apples and chopped nuts. Batter will be thick. Now drop a big scoop of batter to the greased or lined muffins pan with batter. Bake at 400 degree Fahrenheit for 18-20 minutes or until top springs backs when touched. Once done..cool on wire rack and serve. I used only 1/4 cup of sugar but the original recipes calls for 1/2 cup of sugar. The sweetness from apple and 1/4 cup sugar was mild and perfect to us. You can also use regular granulated sugar if you don't have brown sugar. I used Organic Gala Apples. I chopped one apple and grated the other one. *Egg - You can use 1 egg or 3-4 tbsp of banana puree or applesauce. I used banana puree, just smashed 1/2 of a ripe banana and used in the recipe. I used Hodgson Milled Flax seeds, if you don't have it in hand, simply pulse the flax seeds for few seconds and use it. This is off to Vardhini's Bakes Fest happening at Priya's Versatile Recipes. muffins look super yumm. and soft..
Feel like grabbing one right now! I was looking for a some bakes using flax seeds...this one looks perfect. When to add the flax seeds powder? Can we powder the seeds at home and use it as I havevthe whole seeds only? Along with the dry ingredients, now i added it. Yes.,you can powder the seeds coarsely and use it in the recipe. 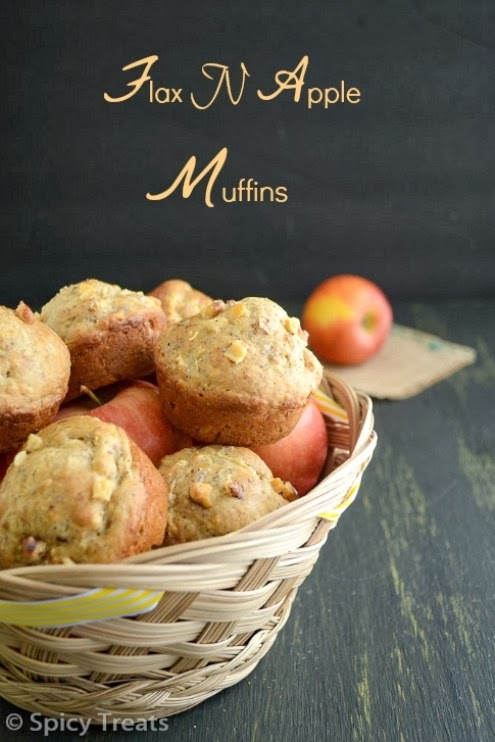 Muffins looks super adorable,spongy and super fluffy..Healthy and prefect breakfast muffins too. healthy and fluffy muffins. nice presentation. Loving this, so healthy and delicious..
nice combo n beautiful luking muffins. 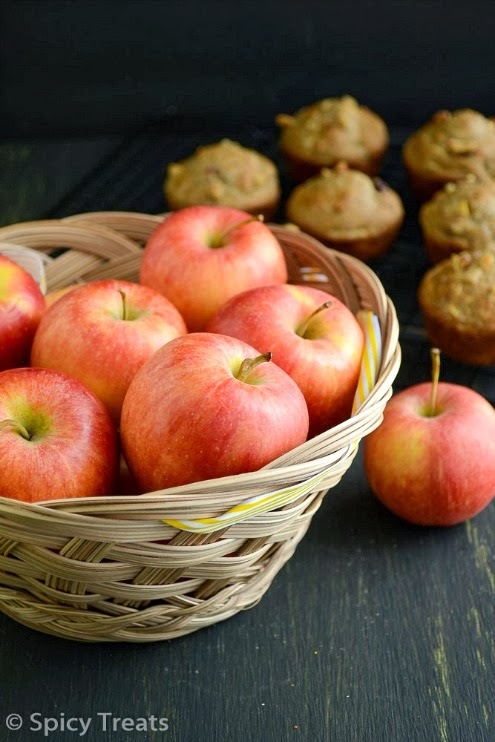 so soft and yummy looking muffins.. nice presentation with the apples..